New paper: Cosmic rays contribute 40% to global warming | Watts Up With That? Releasing Dr. Rao’s findings as a discussion paper on Thursday, Environment Minister Jairam Ramesh noted that “the impact of cosmic ray intensity on climate change has thus far been largely ignored by the mainstream scientific consensus.” He added that the “unidimensional focus” on carbon emissions by most Western countries put additional pressure on countries like India in international climate negotiations. The continuing increase in solar activity has caused a 9 per cent decrease in cosmic ray intensity over the last 150 years, which results in less cloud cover, which in turn results in less albedo radiation being reflected back to the space, causing an increase in the Earth’s surface temperature. Mr. Ramesh emphasised that Dr. Rao’s findings would not reduce domestic action on climate change issues, but he admitted that it could influence the atmosphere of international negotiations. In November 2009, Mr. Ramesh had released a report by glaciologist V.K. Raina claiming that Himalayan glaciers are not all retreating at an alarming pace. It had been disputed by many Western scientists, while IPCC chairman R.K. Pachauri dismissed it as “voodoo science.” However, Dr. Raina was later vindicated by the IPCC’s own retraction of its claim that the Himalayan glaciers would melt by 2035. When Mr. Ramesh sent Dr. Rao’s paper to Dr. Pachauri, he replied that the next IPCC report was paying special attention to the impact of cloud cover on global warming. The Minister expressed hope that Dr. Rao’s findings would be seriously studied by climate researchers. However, Dr. Rao’s paper calculates that the effect of cosmic rays contributes 1.1 watts/sq.m, taking the total contribution of non-human activity factors to 1.22 watts/sq.m. Climate atheist now that’s a better description. This from JoNova’s blog might be interesting in this regard. Play with the transparency slider to see the clouds. Sounds to me as if my countryman Svensmark is coming to the fore here. Maybe the CERN results, when available will further strengthen this line of reasoning. It it not over yet and with the MET office here in UK predicting 2011 beeing cooler than 2010 and the US House of Representatives hopefully beginning to analyse NASA/GISS temperature records we may be on our way to more sense being injected into climate change research. Seems to me that if you want to get ahead in the field of climate science, then the areas to be in are not CO2 warming, one of the many other emerging areas of research. The ground is being prepared for the results of the CLOUD experiment to be released – the final nail perhaps in the AGW coffin. India not country much enamoured by Westerners pushing their ideas in ‘evangelical mode’ believing the Indians are ignorant about life the universe and everything, see the saga of the Southern Baptists, when India has been thinking about such things for the last 10,000 years plus. As an aside, I think their conclusion, in a nutshell, can’t be bettered. It seems as if every few of months the IPCC’s claims are being called into serious question or debunked. Even their scientists credibility is being called into question now. Maybe I’m missing something, but the numbers don’t seem to add up. IPCC says 1.6 W/m2 human, 0.12 W/m2 other, so total is 1.72 W/m2. Dr Rao says 1.1 W/m2 are due to cosmic rays. 1.1 as a percentage of 1.72 is 64%, not 40%? I tink cosmic rays are merely a proxy for solar activity levels and not a significant factor on their own. In fact the changes in solar activity levels act on the polar vortices to alter surface pressure distribution and thus jetstream zonality/meridionality. i) The jet stream started to become less zonal as long ago as 2000. I am on record as having been saying that for over three years now. It is only now being noticed by the mainstream because recent events have shown quite extreme meridionality. In my opinion we are over half way back to LIA conditions. I watched the jets get steadily more zonal from the late 70s to 2000 and noticed the reversal soon after it started. It is not and has not been a ‘short term change’. ii) The supposed Anthro forcing is from more CO2. That has been increasing slowly throughout and therefore cannot be linked to the change of trend as far back as 2000.
iii) The problem for all those ‘best brains’ is that they claimed the zonal trend as a permanent consequence of Anthro forcings. They are having some difficulty in executing the inevitable about turn because it will destroy their small residue of remaining credibility.Some are showing resistance by trying to suggest that increased meridionality does somehow not involve an equatorward shift in net jetstream latitudinal positioning They will have to concede the issue shortly. It is quite clear that blocking high pressure cells divert jets equatorward far more than poleward so any claim that there is a balance is not tenable. iv) The reason for it all is clear in my view.The Polar vortices change size in line with solar activiy. The size of the equatorial air masses changes in line with the rates of net energy release or net energy absorption by the oceans and the jets are pushed and pulled between the two. In consequence global albedo changes because meridional jets generate more clouds, global albedo changes and the globe switches between net warming and net cooling depending on the balance between zonlity and meridionality. v) The only reason this is not accepted by all is the emotional and financial interest in AGW theory. Also interesting the use of religious language to describe the AGW brigade… well it does sound rather like a religion…. Be interesting to see what response there is from western scientists…. He’s wrong about humans having no effect on cosmic rays. Wind turbines are just as effective against them as they are in affecting CO2 levels. Another nail banged into the IPCC coffin by the same Indian minister who released VK Raina’s paper that became Himalayagate! He is doing more to undermine the AGW cult than all the western politicians put together, he is making history whilst our career politicans are making money. “Voodoo science”, Rajendra Pachauri chimes in with a nose dangerously trending upwards. Well, if you add, to that picture of cosmic rays, the picture I’m getting from many sources that data issues (UHI and the rest) are adding something like 0.5 degC, we will end up with no room for party pieces from CO2 et al at all. Maybe its too early in the morning for me, but I just cannot get my head around the maths in this post. Is there anyway of accessing the original paper? I thought solar activity had declined significantly over recent years and we are currently around the minimum. The IPCC rejected the research by Svensmark, probably because it was based on real world observation not some model, and still insist that the GHG theory, which is based on models and poor theory, is correct. I am not surprised by this new paper. Svensmarks book, The Chilling Stars, explains his cosmic ray theory, how it was confirmed through actual real world observation and measurement, and how everyone rejected it because it flew in the face of the established religion, sorry science. Research is in hand at CERN to harden up the mechanism and confirm the theory. Science is full of fact getting in the way of established doctrine but fact always won in the end. Dr .Rao has assumed that the ipcc’s figure of 1.6watts/sq.m for human activity is correct. In fact, this figure is almost certainly a gross exaggeration because the ipcc has assumed a huge positive feedback in water vapour. This means that the solar influence is probably much larger than 40% ; perhaps as high as 80%. whilst the comments are over three years old they do make interesting reading. The Telegraph (of Calcutta, India) also has an article about Rao’s paper which is a bit more detailed than the article in the Hindu. The Telegraph article also mentions the work by the Danish scientists Henrik Svensmark and Friis Christensen on the connection between cosmic rays and climate and comments on it by Veerabhadran Ramanathan, a senior atmospheric scientist at the Scripps Institution of Oceanography, University of California, San Diego and also by Juerg Beer, a physicist at the Institute of Aquatic Science and Technology in Switzerland, who by coincidence is in Goa to attend a conference on space and climate. Intensity of cosmic rays reaching the Earth’s atmosphere is not only a function of the Sun’s magnetic output intensity, but also a result of juxtaposition of two major magnetospheres in the solar system (Jupiter and Saturn), shielding the Earth, together with its own magnetosphere from their impact . The cosmic ray’s Earth impact records are used to reconstruct the past intensity of solar activity, correlate closely with null-function of the above mentioned heliocentric concurrence of the two major magnetospheres. In addition there may be (as yet unrecognised) solar-magnetospheric close circuit electro-magnetic feedback. Somehow one knew that physicists would eventually start having a huge impact on factors effecting climate. The high energy particles (Svensmark’s work) is, so far, the best explanation of how clouds, cloud chambers, etc., work. Out in the IPCC world, clouds just sort of “happen”. Regardless of what one’s position, the nuclear physics, precursor cloud droplets, the experimenbt Svensmark preformed, etc., is, for sure, hard science. I’d bet CLOUD will mostly confirm Svensmark’s work. It’s such a definitive explanation of cloud droplet mechanics. In the end, it will simply add some to the knowledge base and have some impact on the warmist propaganda declarations. I’d also bet that the warmist have a propaganda mime in the wings stating CLOUD confirms runaway global warming. I can even think of four or five narratives that could be used. After all, how many in the general population can work their way through the Lorenz transforms? The real science folks will still have to “step up” to refute the warmist. Never forget, it’s a political and public opinion. Realist science just has to provide ammo for the politicos. Will this peer-reviewed paper appear in the next IPPC report? I am beginning to think I shall soon agree with the IPCC chairman R.K. Pachauri and dismiss this as “voodoo science.” – Though what we dismiss may not necessarily be the same thing. Quote – “According to the latest report by the IPCC, all human activity, including carbon dioxide emissions, contribute 1.6 watts/sq.m to global warming, while other factors such as solar irradiance contribute just 0.12 watts/sq.m.” – So “all human activity, —, contribute 1.6 watts/sq.m to global warming” Are they no longer talking “enthusiasticly” about CO2? And if so, should they be let off that particular hook? The gases emitted from the exhaust pipe, CO2 and H2O amongst them (those two are not the pollutants in exhaust gases by the way but may hold on to heat energy for longer than the rest) are naturally warmer than the air they are emitted into but convection takes it up and away until temp. equilibrium with surrounding air is reached. This is only one out of maybe many thousands of reasons that makes it important to be sure the measurements are made in the right place (or places). I am afraid there may be by far too many for forever changing variables involved to be able to make any sensible measurements (or estimates even) of which heat comes from what and where (even if measuring is possible). Well, has a “slip of the tongue, (or typing finger)” ‘snook’ in here – and it is all the same old thing i.e. not CO2 emissions but atmospheric CO2 which already have been emitted and thus are in equilibrium with it’s surrounding gases that “contribute 1.6 watts/sq.m to global warming”? This is actually a huge “breakthrough,” as such. The Indian press has been stating AGW as fact for over a decade, and it’s worse there than even the UK. Is this the same UR Rao who was publishing science papers on cosmic rays back in 1963? Or is it his grandson? Long career, if it is the same man. Congrats to him! So it may not all be due to CO2? Better paint our roofs white (with Green materials) and send those rays back into space! Piers, I think some people may be saying “cosmic rays” when they mean to include charged particles. Some of this may arise from poor translation filtered through the press. This is good news! If CAGW ever did come to pass (which I very much doubt) we could put up satellites to project charged particles into the upper atmosphere and “seed” clouds to cool us all down again! Now I understand why them climate hippies always run around with tin foil hats. Junk Science: Democrats in Virginia are trying to stop their attorney general from probing climate fraud carried out by university researchers at taxpayer expense. Are they afraid of finding the inconvenient truth? It’s not the crime, it’s the cover-up, as the saying goes. In the case of former University of Virginia climate scientist Michael Mann and his supporters, it may be both. Not only did Mann participate in perhaps the greatest scam of modern times, but he may have also have fraudulently used taxpayer funds to do so. At least Virginia Attorney General Ken Cuccinelli thinks so, and has been diligently trying to obtain from U.Va. documents and e-mails related to Mann’s work there. Mann reportedly received around $500,000 from taxpayer-funded grants from the university for research there from 1999 to 2005. Cuccinelli is alleging a possible violation of a 2002 statute, the Virginia Fraud Against Taxpayers Act. The AG has said that he wants the documents, including grant applications and e-mails exchanged between Mann and 39 other scientists and university staffers, to help determine whether Mann committed fraud by knowingly manipulating data as he sought the taxpayer-funded grants for his research. “I’ve just completed Mike’s Nature trick of adding in the real temps to each series for the last 20 years (i.e. from 1981 onwards) and from 1961 for Keith’s to hide the decline.” It was that attempt to “hide the decline” through the manipulation of data that brought down the global warming house of cards. Mann was the architect behind the famous “hockey stick” graph that was produced in 1999 but which really should be called the “hokey stick.” Developed by Mann using manipulated tree-ring data, it supposedly proved that air temperatures had been stable for 900 years, then soared off the charts in the 20th century. Mann et al. had to make the Medieval Warm Period (about A.D. 800 to 1400) and the Little Ice Age (A.D. 1600 to 1850) statistically disappear. The graph relied on data from trees on the Yamal Peninsula in Siberia. Here, too, the results were carefully selected. Just 12 trees from the 252 cores in the CRU’s Yamal data set were used. A larger data set of 34 tree cores from the vicinity showed no dramatic recent warming, and warmer temperatures in the middle ages. They were not included. Attempting to block Cuccinelli and rising to Mann’s defense are Virginia state senators Chap Petersen and Donald McEachin. They are backing legislation that would strip the attorney general’s office of its power to issue “civil investigative demands,” otherwise known as subpoenas, under the 2002 statute. They claim they are defending academic freedom, but they are trying to hide what many consider academic fraud, work that found its way into the reports of the U.N.’s Intergovernmental Panel on Climate Change. It led to Kyoto and Copenhagen, and formed the basis for the EPA’s endangerment finding that carbon dioxide is a pollutant that needs to be regulated. After Mann left U.Va., he went to Penn State, which the Obama administration awarded with $541,184 in economic stimulus funds to save, according to recovery.gov, 1.62 jobs so that Professor Mann could continue his tree-ring circus fraudulently advancing the myth of man-made global warming that through equally bogus remedies like cap-and-trade and EPA regulations would bring the U.S. economy to its knees. In a glaringly arrogant e-mail, Mann said he was grateful to the legislators for pressing the issue and hoped the action would give Cuccinelli “some second thoughts about continuing to waste their time and resources attacking well-established science.” Hide the decline, then hide the truth. We hope the legislation fails, the truth will come out and Mann et al. will be held accountable for engineering a scientific and economic fraud that would have made Bernie Madoff blush. A story reported in today’s Investor’s Business Daily as an editorial comment shows how far the politicians in Virginia will go to defend Michael Mann’s “hockey stick”. They are proposing a new law that would kill the Virginia attorney general’s current probe seeking to uncover whether there was a violation at University of Virginia, where Mann was employed, of the state’s “Fraud Against Taxpayers Act”. At U.Va Mann received huge taxpayer-funded grants to pursue his possibly doctored research. That probe, if allowed to continue, could have some very interesting consequences. Probably most posters know that there is an interesting debate on going on clouds on Dr Roy Spencer’s site. Well worth a read. It involves just one amongst many reasons for formation of clouds. It may one day be proved wrong – or right, i.e. it has, or has not got a major influence on cloud formation. When, and only then, when it has been proved to have a major influence on clouds, can it be linked into global warming and cooling theories. For the above reason(s) I think it may be a bit early for all of us to dismiss “The cosmic ray climate theory” as rubbish – at least not until it has been fully formulated. Unless, that is, you also dismiss any link between clouds and climate, which, it seems to me, is what the warmers (IPCC) do. Should this become a straw man then one more, or one less, knocked down straw man does not necessarily make their proof for warming by CO2 suddenly appear. – Whether they need it to or not. We should pester them more for proof of their CO2 theory. Maybe shaming TV companies (The BBC is a good candidate as they do have a certain remit) and the IPCC to have a panel of IPCC experts explain their case to a panel of skeptical experts (who are allowed to answer back – uncensored.) – I am talking two groups of scientists here. Mr. Corbyn, I read your linked PDF. Where’s the science? Lots of hand waving. You sound like an alarmist, making claims and not backing them up. Am I supposed to follow a rapidly expanding tree of additional references? There is excellent correlation between cloud cover and cosmic ray flux, and here are examples from WUWT. Mr. Corbyn seems to strongly disagree with the idea that cosmic rays are or create charged particles. Mr. Corbyn, where exactly do your favored charged particles come from? Lightning? Evaporated ocean spray? The basic idea of the cosmic ray hypothesis is they act to tip the balance in favor of cloud formation under conditions near saturation with water vapor. If you have ever built a cloud chamber, or watched one in action, you will understand exactly how it works (we made a simple one in physics lab – very cool). The shower of particles coming from just one cosmic ray will produce multiple charged centers. The clouds formed may not produce more rain, but simply reflect more sunlight. But Mr. Corbyn knows that. It is such a simple and compelling mechanism once the idea is explained. Why the resistance Mr. Corbyn? The figure (URL above) clearly shows the correlation. It is hard to believe cloud cover controls the cosmic ray flux, so it seems likely the cosmic rays are influencing the cloud cover. The numbers in the article don’t add up. In addition, the article contains a number of items that require clarification. One of those is that it seems that the terms carbon and carbon dioxide have been used interchangeably. Aside from that, there is no possible way in which human emissions of either, carbon or carbon dioxide can contribute 90 per cent of warming, not even if both of their alleged warming impacts are combined. The article discusses “carbon emissions” (that could mean soot) that can be controlled by human activities. It also mentions, “The IPCC model, on the other hand, says that the contribution of carbon emissions is over 90 per cent.” However, to my knowledge, the IPCC did not produce any models, nor can I believe that it would be correct to claim that anthropogenic carbon emissions contribute that much to global warming. Farther on, the article mentions carbon dioxide emissions. Is it possible that a physicist is so imprecise, or is it more likely that the author of the article wrote about something he does not quite understand? links to the discussion paper. Unfortunately in his Figure 1, Rao has used Mike’s trick of splicing proxy and instrument data to create the decline. Jairam Ramesh, India’s dynamic Environment Minister has done it again. A paper published by his ministry termed UN Intergovernmental Panel on Climate Change (IPCC)’s claim on human induced global warming, as highly exaggerated as the latter’s impact is significantly reduced by Galactic Cosmic Rays (GCRs) that is responsible for low cloud formation over earth in the last 150 years. Any reader with Dish Network should bring up channel 287, Dish Earth. That channel is a live view of the earth from the satellite. Focus on the cloud cover and consider that a 2% change in cloud cover has the same effect on the Earth’s heat balance as doubling the Atmospheric CO2. From that high vantage point you can see that the Emperor has no clothes. Your basis for saying that? Lots more work to be done, because it seems that they have as yet been unable to established the same mechanism at boundary-layer temperatures. And what of the figure for the GCR ‘forcing’? The sole justification for this is a reference to Lee, S. H. et al., ‘Particle formation by ion nucleation in the upper troposphere and lower stratosphere’ http://www.sciencemag.org/content/301/5641/1886.full.pdf which I’ve just looked at, and while it provides evidence for an increase in potential nucleation, whether this results in more clouds is by no means certain, as the paper concludes It has also been suggested that ions produced by cosmic rays can induce nucleation of particles that may grow into CCN and modify cloud properties …. I can find no justification for stating this as a bald fact nor for calculating such a concrete figure (with no uncertainty bars) on it. Has MacCracken et al been debunked. Well even more impressive is looking at that tropical swath around the midriff, that is almost devoid of both land and cloud. Guess what fraction of incoming solar energy must be getting deposited in the deep oceans. Note also that the sahara region of North Africa is likely a Desert, as is the south western United States, and notice also the lack of cloud over that central South Aerican band; which I presume is where that Atacama or whatever it’s called desert is; supposably among the driest on Earth; and that big island North west of New Zealand, seems all desert except for the NW snippet. Well call them whatever you like; butit is a demonstrable fact that primary cosmic ray particles striking the earth’s upper atmosphere end up creating charged particle tracks . Such tracks are easily observed in Wilson Cloud Chamber, and also photographic emulsion tracks. So whether those ionisation tracks are caused by lower energy and maybe charged particles from the sun or by high energy, either charged or uncharged particles from deep space; it is fair to use the term cosmic rays to capture all those sources of high atmosphere ionisation tracks caused by some species of incoming energetic particles. Such events also produce neutron events which can also be detected at the surface, as a signature of “cosmic ray” events. And such ion tracks DO result in cloud or water droplet nucleation; the question is NOT do they; but HOW MUCH do they create. No, there is no evidence and trace of any such [and none would be expected above the noise]. This peer-reviewed paper http://www.leif.org/research/2009JA015069.pdf [e.g. Figure 10] finds otherwise, namely that HMF during the latter part of the 20th century was comparable to HMF 1830-1870, and that no such steady increase has taken place. This simply yanks the rug out under the Rao paper. End of discussion. If we account for the contribution of 1.1 Wm–2 from galactic cosmic ray induced warming, the net contribution from non-anthropogenic factors including solar irradiance towards global warming goes up to 1.22 Wm–2, as against the total net contribution from anthropogenic factors of 1.6 Wm–2. Consequently, the contribution of increased CO2 emission to the observed global warming of 0.75°C would be only 0.42°C, considerably less than that predicted by the IPCC model, the rest being caused by the long-term decrease in primary cosmic ray intensity and its effect on low level cloud cover, due to the increase in HMF. 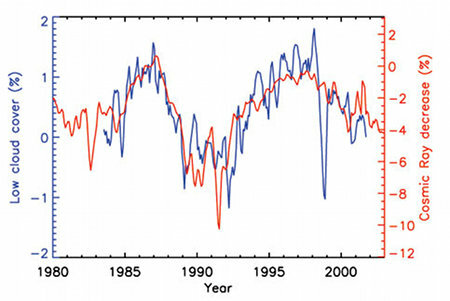 A review of recent literature lends credence to Rao’s model, but the observed rapid warming trend during the last 40 years cannot be accounted for by the trends in GCRs. This does not by itself negate the importance of GCRs as a forcing factor of climate change, but rather strengthens the case for greenhouse forcing as the primary driver of the recent warming trends. I hope this may soon shed more light on how cosmic rays that penetrate Earth’s atmosphere can have a profound effect on our climate. If Earth is shielded from cosmic rays by magnetic fields including the Sun’s, and if the Sun’s field varies with the long-term cyclic variations of the 11-year sub-cycle of those (magnetic) sunspots, such long-term cyclic modulation of the Sun’s magnetic field could account for the pronounced warming period during the latter middle ages and the subsequent Daulton minimum when crops froze and hunger or starvation prevailed. There is no dispute that anthropogenic carbon dioxide was not a factor affecting Earth’s climate during those previous periods of wide global-temperature variations. publication, which i know about. precision instrument and is providing very high quality data. We expect to have our first results published in the next 2 months. These links to the CERN document server were accidentally deleted from my previous posts, so I will try again! These links to the CERN document server regarding CLOUD were accidentally deleted from my previous posts, so I have fixed them (I hope) and will try again because they are informative! When working on this [ http://wattsupwiththat.com/2010/12/23/confirmation-of-solar-forcing-of-the-semi-annual-variation-of-length-of-day/ ] I went through the whole OMNI2 database [ http://omniweb.gsfc.nasa.gov/ ]; neutron count rates were by far the best match, so my question (& I don’t need a premature answer today, rather I’m hoping qualified people will take their time thinking about this) for physicists, earth orientation parameter experts, etc. is: What key variables (i.e. that are not in the OMNI2 database) are confounded with neutron count rates if cosmic rays are not the key? Thank you very much for the link. I have a great respect for V. Ramanathan. The paper about cosmic rays is very interesting, but it is not relevant for modern (i.e. from the mid 1970s to the present) global warming. The reason for this is that cosmic ray flux is a function of solar activity. When solar activity is high, cosmic ray flux is low, and viceversa. In effect, there was an increase in solar activity since the Little Ice Age, but this increase stopped in the 1950s. 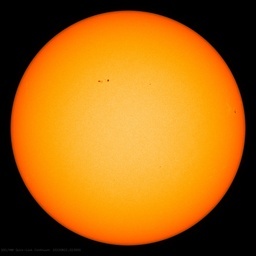 Since the 1950s, solar activity was first flat, then began a slow decline that seems to be in the last few years leading us to a new Dalton Minimum or even a new Maunder Minimum , that is, back to the level of the Little Ice Age. There is a strong 11-year cycle, but very little trend. terminated in the current rapid warming trend which is continuing unabated until now. That is, at the same time that the solar activity stayed nearly flat and then declining, modern global warming began. This fact excludes the possibility that the responsability of Greenhouse gases to current global warming is lower than the IPCC affirms. It helps however, to understand the reasons of the early 20th century warming (1910s-1940s). Lucy Skywalker says: Well, if you add, to that picture of cosmic rays, the picture I’m getting from many sources that data issues (UHI and the rest) are adding something like 0.5 degC, we will end up with no room for party pieces from CO2 et al at all. Lucy, there is a simple experiment that shows that CO2 is substanially nil. If you could make convection nearly nothing, and make water in the air nearly nothing, and make cloud cover nearly nothing, you would be left with the CO2 effect. So what happens when nature runs this experiment for us? When one side is abetted by editorial boards to publish defamatory invectives as “reviewed” scientific articles (Laut, Rahmstorf et al….) without ever checking with the defamed parties, and the latter (Svensmark, Shaviv, Veizer…) are stonewalled or even denied a right to respond, then any alternative suggestions to AGHG can indeed be conveniently dismissed as “discredited”. Moreover, in this particular comment, are the references to partisan blogs to be considered “reviewed literature” ? The issue is not so much whether the GCR are directly nucleating protoaerosols (clouds) or whether their records (direct and via proxies) are only a reflection of past solar intensity. The plethora of correlations of climate variables with solar indices, over many time scales, argue that the sun has played an important role in climate and we should therefore be asking “what is/are the solar amplifier(s) ?” instead of consistently ignoring or downplaying the role of the sun. At this stage both scenarios are feasible, and likely complementary, and should be treated in an objective and non-partisan way. I regret the temporary lapse in my resolve not to get involved in these discussions outside the realm of scientific literature, a resolve that I maintained for many years. Please delete my “Commentary on Phil Clarke statement” from the blog.